All the benefits of the Nexus meter, but smaller! Compact, multifunctional blood sugar machine with advanced GDH-FAD enzyme technology for an entirely accurate blood sugar test and simple self-management of blood glucose levels. 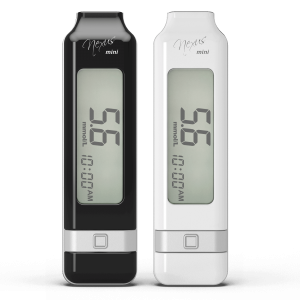 GlucoRx Nexus mini meter uses only GlucoRx Nexus Test Strips and GlucoRx Lancets. The GlucoRx Nexus mini starter Diabetes test kit includes a blood glucose meter with batteries, 10x test strips, control solution, lancing device, 10x sterile lancets, owner’s manual & quick guides, daily log book, warranty card & protective wallet.